I have been writing up a storm over at the Well Fed Network these days but not posting (as I should) here because things have been hectic! I have included my latest Spirit World article below for your sugar high consumption needs. This monthÃ¢â‚¬â„¢s drink for the Designated Driver is actually much more for the sugar-addicted than any other drink I have written about here before. I would be afraid to guess how many calories it might contain. It is honestly only for hard-core fluff lovers and adventerous adults and children. 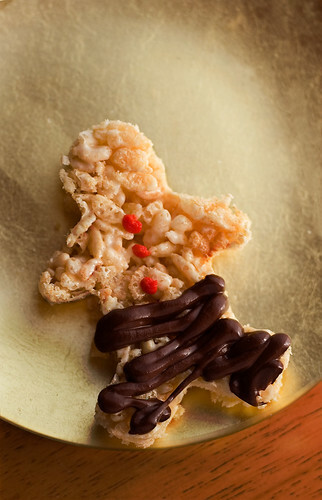 I decided on this concept when I was making some rice crispies christmas cookies earlier this month. The fluff you use to make those cookies is really an amazing compound material. While it was cooking in the pan, it sort of deflated and became less than it was so I wanted to see what I could do with it that kept its glorious color and texture. I surfed over to the official Fluff site and found their online cookbook (PDF) with all sorts of high-caloric nefarious recipes! 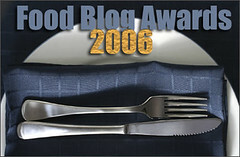 This is actually the 9th edition of the Yumybook, the first was published in 1930! On page 13 are their Ã¢â‚¬Å“shakesÃ¢â‚¬Â, drinks made from fluff, milk, and various amendments. 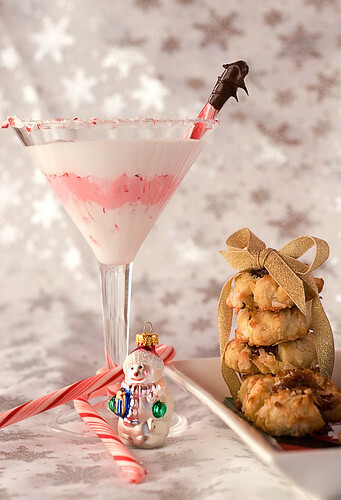 I extended the concept and created the Peppermint Fluff Martini in this post. I am sure you can come up with your own favorite variation! This recipe could benefit from the addition of peppermint schnapps if you were so inclined. I am working on one made with kaluha myself. The Yummybook directions call for the use of a blender, I used a stick immersion blender instead. It works just fine. Into a tall narrow mixing container add the fluff, milk, and 1 drop peppermint oil. Mix until all fluff lumps are gone. Split mix in half and add red coloring to one half, mix until incorporated. Layer the white and pink fluff with additional peppermint chunks throughout. 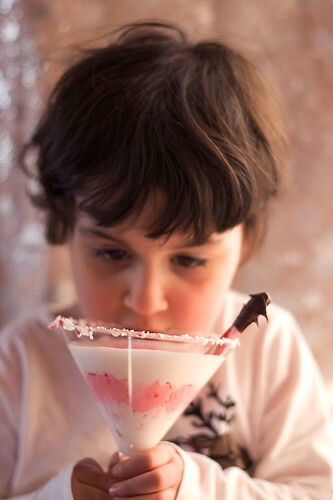 To decorate top edge of glass (as shown), before assembling the drink dab a small amount of fluff on the edge and then dredge in finely crushed peppermint candy. Finish with chocolate dipped peppermint stick. Give to your loved ones. They will be lucky to finish one of these.